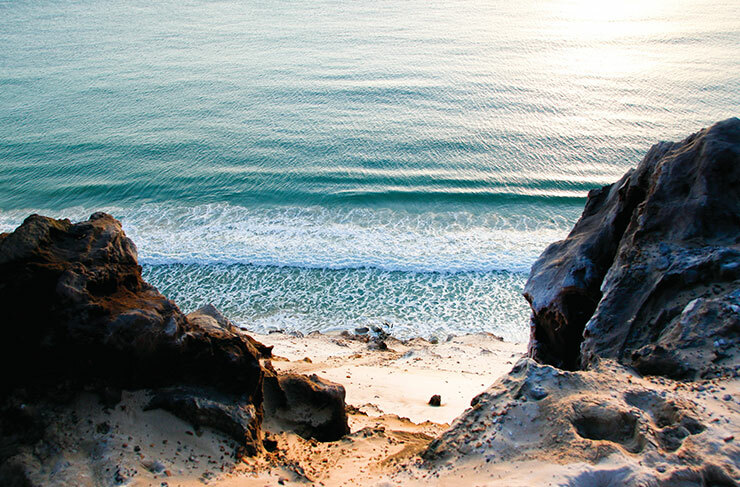 Rainbow Beach has three particularly famous neighbours: Fraser Island, Cooloola National Park, and the Pacific Ocean, so there’s an excellent chance you’ve never been there before. Fraser Island tends to hog most of the stay-cay spotlight (biggest sand island in the world and all that...) and Noosa, because, well, it's Noosa. Poor old Rainbow gets left off most itineraries, which (TBH) is probably just how the 1000-odd locals like it. It’s a sleepy little fishing and surf town that hasn’t changed much in the last twenty years. You get the feeling it’ll boom one day, but in the meantime, it’s a proper gem. Here’s everything you should check out in Rainbow Beach. Who is Carlo and what is a sand blow? Those were the two questions we asked first. Carlo, as it turns out, was one of Captain Cook’s least important deck hands (most other sailors got beaches, islands and points named after them—Carlo got a sand blow). So what the hell is a sand blow? It’s an enormous migrating swathe of sand, pulled up by the strong offshore currents, then blown onto the mainland, covering trees, hills, houses and anything else that gets in its way. The views up here are speccy, especially at sunrise and sunset (the locals also come up here for make-out sessions, picnics and slightly illegal sand boarding). Carlo is moving towards Rainbow Beach town like a very slow unstoppable sand avalanche. In a few thousand years, property prices here will be in trouble. Rainbow Beach. The clue’s in the title. This is the multicoloured stretch of sand that gave the town its name (and most of its tourism revenue). There’s a series of beachside cliffs about 2km from the centre of town, and the various minerals in the rock have created a rainbow effect—72 shades of orange, red, amber, and brown, rippling for miles and miles. It’s a pretty awesome spot (defs charge the phone for some Insta gold). If you keep moving along the beach, you’ll reach the tidal inlet—campers set up tents here, fish right off the sand, or surf the modest breaks. But there are also about ten million soldier crabs who call these mudflats home. Swing by at low tide and you’ll see carpets of them moving along the beach. Just watch your footing. This is legitimately one of the prettiest spots we visited in Queensland. A 19th-century lighthouse, standing high on the cliffs, with views over the Pacific Ocean all the way to Fraser Island. 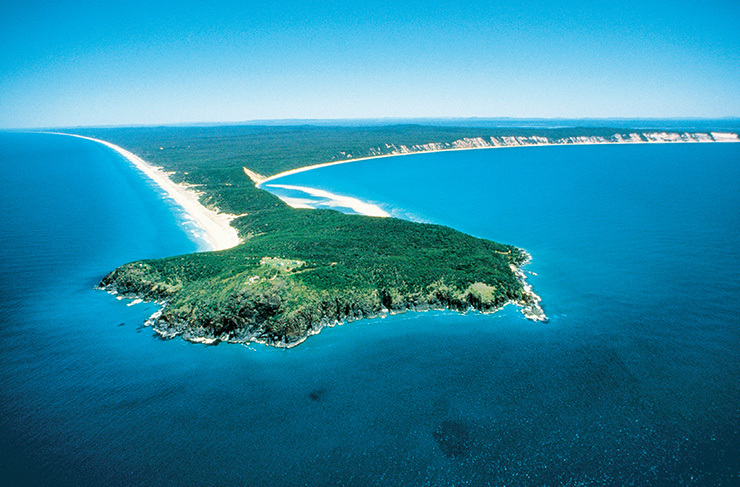 Double Island Point is actually the rocky spit that forms Fraser Island—the currents carry sand all the way up Queensland’s coast until they hit this spit. They used to allow cars up here, but now you have to hoof it from the beach down below (the only ones with driving permits are the legends at Great Beach 4WD Tours). To the south, beneath the point, you’ve got a cracking surf beach (don’t tell anyone, but Chris Hemsworth, AKA Thor, surfs here). Bring a picnic, sit outside the lighthouse and soak up some serenity. Just don’t forget the sunscreen—there’s not a lot of shade at the top. Bring water too. Lots of water. From Double Island Point you can spy a couple of rocky nubs sticking out of the water to the north, about 200m off the coast of Rainbow. That’s Wolf Rock. From the surface, it doesn’t look like much, but this is actually one of the most celebrated and sought after dive sites in the entire world. 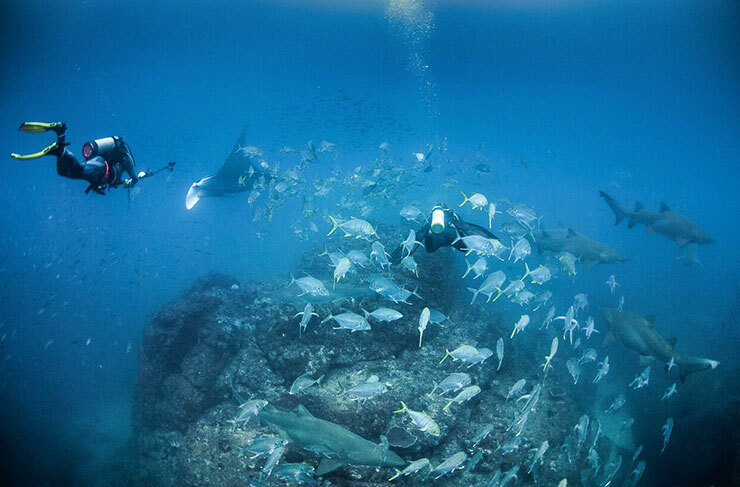 Seriously, celebs and dive pros fly to Rainbow just for this. Wolf Rock itself rises from the seabed as a series of four volcanic pinnacles. It’s home to the region’s biggest population of Nurse sharks (don’t worry, they won’t eat you if you don’t eat them). You can go on boat tours out to Wolf Rock, but divers need to be experienced. Apart from the 300-odd sharks swimming ‘round you, the currents around here are pretty treacherous. One for the pros only. Rainbow Beach isn’t exactly a culinary mecca. You don’t come here for celebrity chefs or highfalutin concept restaurants. But that doesn’t mean you can’t get a bloody good feed. The Surf Club down on the front beach is always friendly and fresh (the seafood, as you’d expect, is fantastic), But if we had to pick one place, it’d be Arcobaleno. It’s a button-cute little restaurant, tucked off Rainbow’s main street, overhung with fairy lights and dishing up amazing fish, woodfired pizzas and desserts that make you groan and undo top buttons. The atmosphere is just right—not too stuffy, nice and relaxed. The perfect Queensland dinner spot. Technically the Great Sandy National Park covers pretty much everything you can see in this region, including Fraser Island. 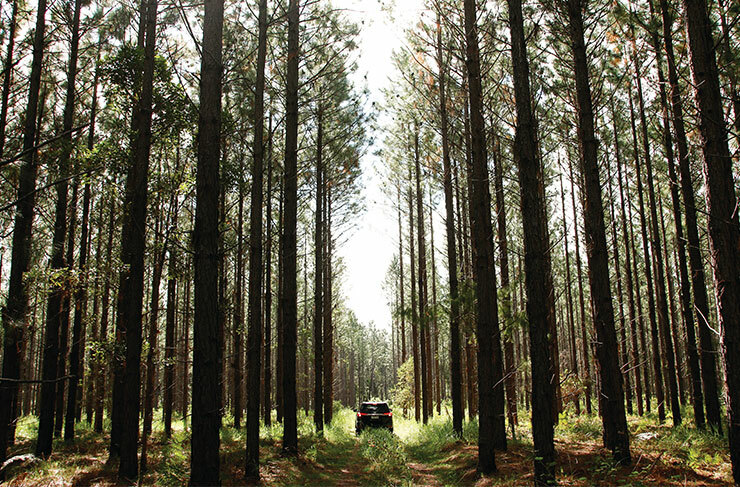 But we’re talking about the Cooloola stretch between Rainbow Heads in the north and Noosa Heads in the south—an unbroken 200km stretch of white sandy beaches, ripping surf breaks, and sandy coastal forest. The trees here are a hardy breed, and they have to be. They’re growing on sand (there’s actually colonies of bacteria in the soil that break down nutrients and supply the roots with nitrogen). The best way to explore this stretch? The guys from Great Beach 4WD Tours. They’ll lead you through the depths of the rainforest, then sprint down the Great Beach Drive—a tack-flat sand highway with its own speed limits, road rules and coastal camping ground (keep an eye out for the pirate flags). You’re in Queensland, right? If you don’t stand up on a surfboard for at least 3 seconds, did you even come here? Rainbow Beach is a very beginner friendly break—shallow and warm with a gentle roll. The odds of you getting dunked are minimal, and the guys from the Rainbow Beach Surf School are lovely (and freaking hilarious). Start with the lessons on the main beach before graduating to Double Island Point. Prices start from just $32 for a 2-hour session, which is bloody good value. Reward your efforts with some fish and chips at the Surf Lifesaving Club. Still looking for some more fun? 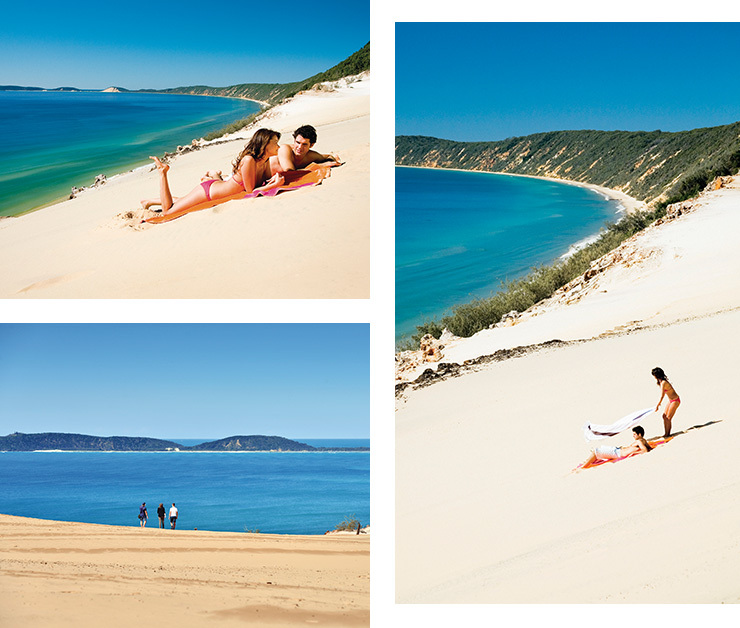 Why not check out our guide to the 30 best things to do in Noosa here.